On Tuesday, 8 May 2018 the Turnbull Government handed down the Federal Budget 2018/19 which included lower personal tax rates for all Australians through the Australian Government’s Personal Income Tax Plan. 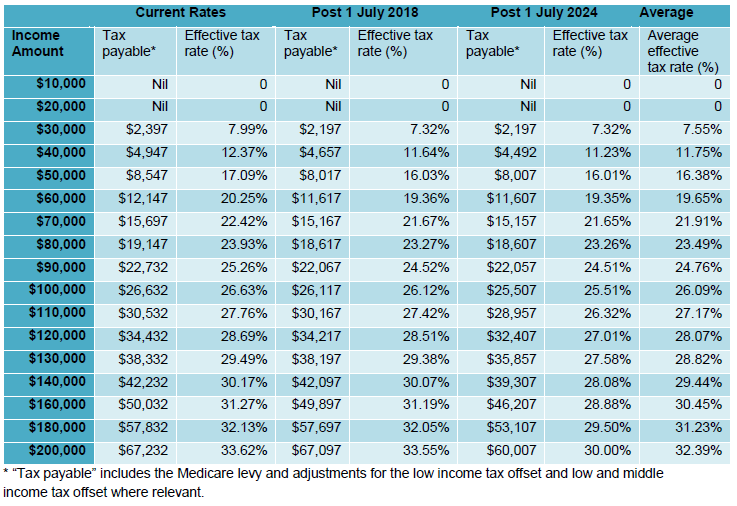 Senior Tax Counsel Professor Robert Deutsch and Tax Counsel Stephanie Caredes at The Tax Institute – the leading forum for the tax community in Australia – have worked up some very revealing numbers showing the effective rate of tax at different levels of income now, post 1 July 2018 and post 1 July 2024 based on the Government’s personal tax rate plans. The Table below encapsulates their research. “After 1 July 2024, the actual tax paid will be $8,007 for the $50,000 earner and $53,107 for the $180,000 earner. Furthermore, the effective rate, which is what really matters, is highly progressive rising gradually from nil on an income of $20,000 to 30% on an income of $200,000,” said Professor Deutsch.